Kitchen Scraps Vegetable Stock - Wholly Delish! A couple of months ago I was chatting in the kitchen of our family friends and lamenting the lack of green bin composting in our town. My friend – aka Danny Onions – told me that he keeps vegetable trimmings in his freezer and then uses them to make stock. What an ‘aha’ moment for me! For years I have been making my own stock with leftover chicken bones, but since we’re more and more eating a plant-based diet I’ve not been making stock as often and had taken to buying vegetable stock in tetra packs. I immediately picked out a large container and started saving my vegetable scraps in the fridge. Within a week or so I had enough to make a big batch of stock. I threw all the scraps onto a large baking sheet and dry roasted under the broiler for a few minutes before adding to a large pot of water. All I added was a few Bay Leafs and some salt and pepper. Four hours of simmering later and voila! Delicious homemade vegetable stock! How was I only starting to this now!? Each batch makes about 12 cups of stock which I use to make noodle soup for the kids, as a cooking liquid for flavourful rice, for pasta sauce and veggie gravy all week long. Of course, until I get around to setting up a compost system I still end of throwing the scraps in the garbage…but at least now I’ve harnessed all their flavour first! How many different ways will you use this vegetable stock? However you use it you’ll be sure to feel good about the simple art of creating flavour from something that would otherwise just be waste. Dry roast vegetable scraps under the broiler on a middle rack for 3-5 minutes until starting to brown. 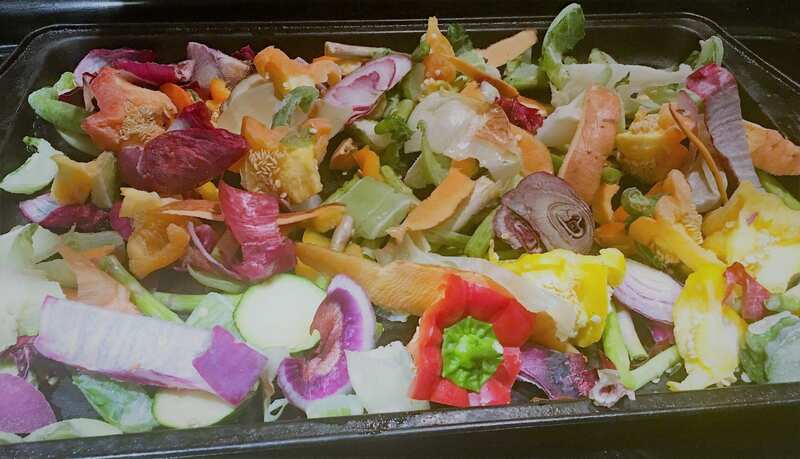 Add roasted vegetable scraps to a large pot and fill with water. Bring to a boil, then reduce heat to low. Summer for 3-4 hours until flavourful. Strain well using a fine sieve. Cool before adding to jars. Store in mason jars for up to two weeks in the fridge.